The PS3 version of Call of Duty: Black Ops will weather the hacking storm just fine, as Treyarch prepared for it in advance. 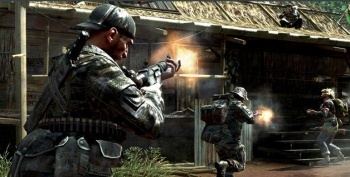 Older Call of Duty games might be suffering because of the PS3 hacks right now, but Treyarch community manager, Josh Olin, says that the studio has reinforced Black Ops against them. Olin said that the hacks were a much bigger concern for Sony as a platform holder than they were for Treyarch as a developer. He said that Treyarch had built additional layers of security into Black Ops as a precaution. When it heard the news that the PS3 had been hacked, it was more a case of utilizing what was already there, rather than having to put together anything new. "I remember the meeting after all the headlines broke," he said. "We were like 'well, I guess, it's time to turn on the security for the PS3 now!'" Olin also seemed unimpressed with the likes of GeoHot and Fail0verflow. He said that while they claimed they only wanted to hack the PS3 to run homebrew software, there was no way that they didn't know about the wider repercussions their actions would have on the PS3 audience. Quite apart from his comments about Black Ops, Olin has essentially encapsulated the perennial problems that homebrew software presents. Regardless of the hackers' original intentions, it's almost impossible to separate homebrew and piracy - at least, not for any significant length of time. Still, PS3 Black Ops players should be pleased to hear that they don't have to worry too much about cheaters in the game, especially not after the technical problems that many of them have had to contend with.